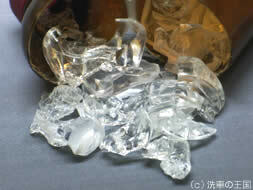 This product will form hard glass coating to protect car wheels. One application should last very long time. It is very different term than polishing products sold in shops. This “WHEEL CRYSTAL” provides the highest grade protection available in the market.Your wheels have less chance to get scratched and provides long term luster.In addition to the usual aluminum wheels, the product can be used to color painted wheels, plated wheels and sputtering processed wheels. Detailed pictorial instructions available. Gives an easy to use manual for everyone to use by following this instructions. This product is only available through online shopping and not available from shops. If you have used other product but not satisfied, you may find this product different to others. This product will form hard glass coating to protect car wheels. One application should last very long time. It is very different to polishing products sold in shops. This “WHEEL CRYSTAL” provides the highest grade protection available in the market.Your wheels have less chance to get scratched and provides long term luster.In addition to the usual aluminum wheels, the product can be used to color painted wheels, plated wheels and sputtering processed wheels. We will be including detailed instructions with photos. It is easy to use for everyone to use by following these instructions. Wheel Crystal is to form the high purity inorganic glass coating for wheels and the coating surface will last quite long. This product provides the highest grade and quality protection from scratches and dirt, and captivates everyone by its extremely glossy looks. In addition to the usual aluminum wheels, Wheel Crystal also can be engaged to colour painted wheels, plated wheels and sputtering processed wheels. The detailed instruction guide with photos is included so that an application is quite easy for any users by simply following the instructions. If you have used other product but not satisfied, you will definitely find Wheel Crystal totally different compared to others. Excluding SENSHA, almost 100% of wheel products available in the market are oil base products. Those oil base wheel coating cannot avoid oxidization and deterioration, and oil base coatings are easily washed away by water or rain. Besides, oil-coated wheels will start looking dull after oxidization and deterioration of coating surfaces, moreover, it also makes difficult to remove brake dust even washing. If you leave this, wheel conditions will be worse than before the application. 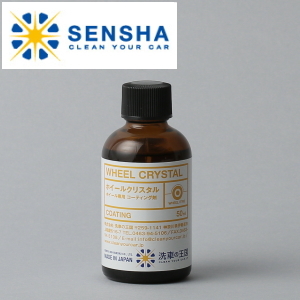 Wheel Crystal only contains glass coating ingredients hence will never be oxidized and deteriorated. You will enjoy its hyper glossy looks and the protection power. The coating film of Wheel Crystal is great heat resistant, is not deteriorated at just 1,000 degrees. Thus, this product will last long to protect wheels under sever conditions such as dirt, sand, iron and heat. You will find it is easy to wash and clean glass-coated wheels after an applications. Wheel Crystal can be applied both surface and back sides of a wheel. One Bottle (50ml) is adequate to coat 4 large size wheels on both sides. If you apply this product while wheels are still dirty, those dirt might not be removable after the wheels are glass-coated. Please make sure that the wheels are completely washed and cleaned up before you start applying the product. If you have applied wheel wax, you are required to remove this before an application. We suggest Wax Off for this work. This product will be hardened by contacting air. You cannot keep the product after opening the bottle. Please finish using the product soon after opening the bottle. As for excess solvent, please be sure to discard it.